Dr. Michiharu Nakamura, Senior Advisor of JST, attended the 3rd High-Level Political Forum on Sustainable Development (HLPF) from July 9 to 18, 2018 at the UN Headquarters in New York. The HLPF, the United Nations' central platform for follow-up and review of the 2030 Agenda for Sustainable Development and the Sustainable Development Goals (SDGs), is held in July every year. Participants reviewed progress and shared the next actions, focusing on six goals of the 17 SDGs; SDG6 (water), SDG7 (energy), SDG11 (resilient cities), SDG12 (sustainable consumption and production), SDG15 (terrestrial ecosystems), and SDG17 (the partnership). The second part of HLPF started from July 16, and the representatives of 46 countries presented on-going activities in their own countries. More than 2,200 people from UN agencies, major groups*1, governmental agencies, education and research institutes, and industry participated, and ministerial level officials from more than 125 countries also attended the HLPF 2018. The HLPF 2018 exceeded in not only in the number of participants, but also regional diversity compared with the STI Forum*2 held in June in this year. During the HLPF, more than 250 side events were held at meeting rooms of member nations’ representative offices inside and outside of the UN building in addition to the main site. It has been two and half years since the start of the SDGs' activities in 2016. The United Nations Statistics Division reported that six goals (6, 7, 11, 12, 15, and 17) focused on in this year's HLPF would not be attained by 2030 under the current situation. While renewable energy share improving steadily, the issues such as water scarcity, expansion of slums and others are still in serious situations due to the increase of natural disaster risks and global warming. Regarding science, technology and innovation, the co-chairs of the third multi-stakeholder forum: Mr. Toshiya Hoshino, Deputy Permanent Representative of Japan, and Mr. Juan Sandoval Mendiolea, Deputy Permanent Representative of Mexico, presented the role of STI for the attainment of the SDGs, especially the necessity of “STI for SDGs” roadmaps, the establishment of open platform, and the impact rapid technological changes, such as AI and ICT are having on society. Furthermore, the Local and Regional Government Summit was organized as a special event of the HLPF for the first time. About 300 people, including the mayors of cities such as Belin, Barcelona, Quito (Ecuador), and Kitakyushu etc., regional coalition parties and other stakeholders gathered. They proposed that cities and regions are on the front lines of implementation of the SDGs, and that their perspectives in reviews and assessment of the SDGs should be included at the global and state level. In the SDG Business Forum, a total of 500 people from CEOs to members of the CSR divisions of SMEs and multinational corporations, economic organizations such as Keidanren of Japan, NGOs, representatives of member countries and UN agencies participated. They shared ideas and initiatives that could create new values, market, and employment while considering the environment is essential for the achievement of SDGs and that the private sector needs to play the key roles. On July 17, Dr. Nakamura attended the side event held by the United Nations Economic and Social Commission for Asia and the Pacific (ESCAP) and other regional commissions in cooperation of the G77. He pointed out the importance of capacity building for propelling science, technology and innovation to achieve the SDGs. For that, it is necessary for policies and research institutes, academia, industry and others to connect with each other to collaborate through discussions and implementation of concrete action plans. 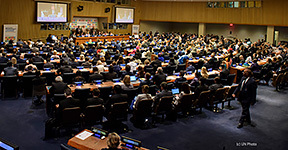 The UN HLPF 2018 reached a conclusion that it still has a long way to go to achieve the SDGs if the situation remains unchanged, and it called for urgent action to accelerate our transformation by collaboration between not only UN organizations and the governments of member states, but also civil society, industry, regional bodies, academia, research institutes and others under the common framework of the SDGs. For that reason, increasing social understanding of the SDGs and launching new coherent activities should be strongly promoted to achieve the SDGs. *1 The United Nations Major Groups are the formalized nine sectors of society that serve as the main channels through which broad participation would be facilitated in UN activities related to sustainable development. These include: women, children and youth, farmers, indigenous peoples, non-governmental organizations, local authorities, trade unions, science and technology communities, business and industry.